When you want to create the greatest possible mobile app that you can build, you likely already realize that you’ll need a strong foundation to start with. Building an exceptional mobile app isn’t so different from crafting a luxury home in this respect. It all begins with the blueprint, base and groundwork. In the case of mobile, you’ll need a strong and durable mockup before you even consider putting your development team to work. Thankfully, app entrepreneurs have been gifted with an abundance of options to choose from when it comes to selecting a top-quality mockup tool to use. And there’s absolutely nothing wrong with performing your initial mockups on paper. Don’t let anyone tell you otherwise. There’s even something special about telling a friend your spontaneous new app idea, while immediately sketching out its wireframe on notebook paper. But, we’ve put together a list of The Best Mockup Tools for App Entrepreneurs for when you’re ready to make your mobile app mockup official. Your developers will thank you. Our top mobile mockup tool is Pidoco. Even beginners will find Pidoco surprisingly easy to use, while power users benefit from features like global layers, master templates and an extensive set of interactions, including touch gestures and transitions. 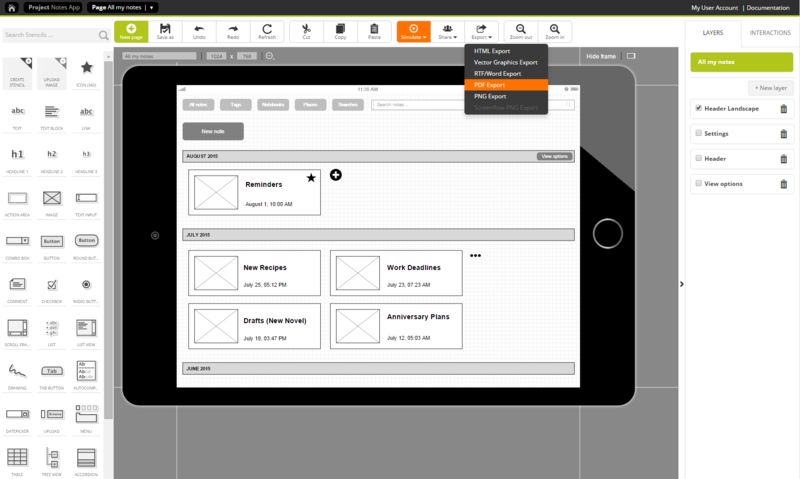 Pidoco comes with 400+ UI elements and icons and offers a “sketch” mode in addition to the classic wireframe look. But perhaps it’s the ability to quickly create near-perfect prototypes by linking uploaded screenshots with hotspots and view them directly on mobile devices that make Pidoco the tool of choice for professionals in over 50 countries. 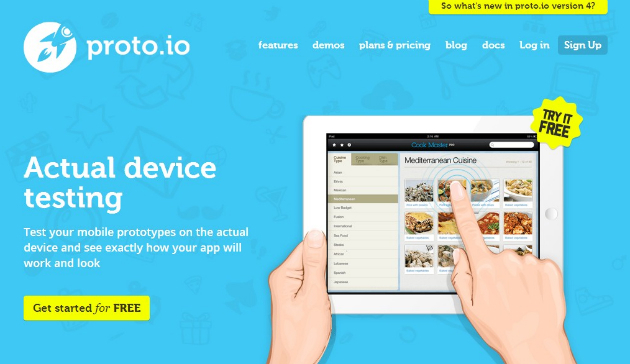 The most highly-recommended wireframing solution throughout all of mobile is Proto. Its greatest selling point incorporates the fact that it provides the most-realistic mobile mockup capabilities available in a web browser, at a very reasonable price. Major companies like Disney, Indiegogo and Nordstrom all use Proto to create near-native experiences prior to actually doing any true development work. No coding is necessary, and it’s extremely simple to use. This HTML5 app makes it simple for any app entrepreneur to craft UI concepts, wireframes and mockups. Moqups’ snap-to-grid feature makes it simple to interconnect iPhone and iPad buttons, switches, menus, alerts and so much more. This favorite tool of mobile developers everywhere is actually available for anyone to use – whether you’re pitching an app idea to investors, or doing the programming yourself. It’s used by powerhouse technology companies such as Mozilla, Microsoft, and Intel, so you’ll likely find Moqups to be more than fit for your own personal needs. Another powerful browser-based HTML5 app which boasts drag-and-drop technology is Fluid. This savvy piece of technology keeps things simple for novice users, yet simultaneously provides us with high-end features such as the ability to preview mockups instantly through use of the Fluid player. This allows users to receive immediate feedback on their work-in-progress. With almost 2000 (and counting) readily-available iOS, Android and Windows 8 mobile UI elements, there are ample opportunities to craft a polished mockup with Fluid. Creating an impressive wireframe doesn’t always have to be endlessly complex. For when you simply want to push out your idea and capture it clearly on a mobile template – there’s Wireframe. Simply select a horizontal or landscape mobile template from the upper left-hand corner, then use your cursor to click, drag and draw. You can double-click to perform editing if you’d like, while maintaining an ultra-minimalistic approach to wireframing through the tidy and uncluttered workspace that you’re provided. 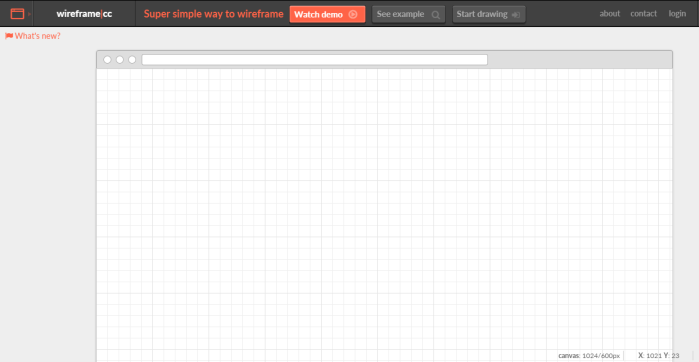 Creating mockups truly is a breeze with Wireframe. Built with both speed and performance in mind – Balsamiq encourages its users to creatively blend their imagination with a unique, virtual-whiteboard-style wireframing functionality. With almost 100 UI components and roughly 200 icons currently available, in addition to a community-full of user-generated components, there’s an abundance of elements, templates, objects and so much more ready for you to use on Balsamiq. Perfect for app entrepreneurs who operate on the “lean startup” methodology – Balsamiq ensures that your team won’t waste any time on the little details that won’t matter until later. Fast, quick and simple to use – UXPin prioritizes providing designs with foundations ita1318208245743ed in amazing user experiences. There’s an art to a crafting a sound mobile user experience, and UXPin seemingly understands this the most of all mockup companies around. They’ve evolved their entire brand around this concept, and UXPin passes the benefits of molding exceptional UX’s on to your end-users. With a fully-loaded toolkit offering plentiful elements, icons and designs for you to choose from – going with UXPin for your mobile app mockup is an easy choice to make. The Justinmind Prototyper proves that it can still be well-worth downloading an actual application to fulfill your iOS or Android wireframing needs. When you need to convey detailed aspects of an in-depth mobile app, Justinmind seems to provide the best option for putting together a mockup as easily as possible. It’s a codeless, clickable and detail-rich application that makes for an excellent option when creating your next mobile app mockup. SnapUp is an all-new HTML5 webapp from QuickFocus. Easy to use by anyone from software developers, UI designers, and even project managers. One of the very best features is the sophisticated set of collaboration features, which boasts real-time updates, a built-in commenting and annotation system, and even public sharing with universal links. SnapUp provides one of the easiest and fastest ways to build wireframes for virtually any software project, be it for a desktop, tablet, or mobile app. PowerMockup is a prototyping toolkit for Microsoft PowerPoint. It helps you create wireframes and mockups for websites as well as mobile and traditional desktop applications. To build a prototype, simply select items from the PowerMockup shape library and drag them into a PowerPoint slide. Although PowerMockup’s library is already quite extensive, the PowerMockup team is continuously expanding it. You can help expand it by adding your own shapes and building a custom library of commonly used shapes that can be shared with other users. Overall, there are more than enough tools to choose from when it comes to selecting an advanced, high-quality and interactive piece of technology to use towards building the delicate framework of your next mobile app. Whether you desire the easy-to-use and simplistic functionalities of Wireframe, or the professional-level capabilities of UXPin – there truly is an option to keep everyone happy when attempting to decide on the best app mockup tool to use. Whether you’re an app entrepreneur, coder or simply an “idea guy” – mocking up your next app’s concept with one of the exceptional options which we’ve listed will surely provide you with the opportunity to achieve amazing success in your field.